Aluminum wiring, used in some homes from the mid 1960’s to the early 1970’s, is a potential fire hazard. How safe is aluminum wiring? According to the U.S. Consumer Product Safety Commission, fires and even deaths have been reported to have been caused by this hazard. Problems due to expansion, or more likely micro-fretting and arching at the connectors, can cause overheating at connections between the wires and devices (switches and outlets) or at splices. The connections can become hot enough to start a fire without ever tripping a circuit breaker! This is why it is so important for you to change your wiring over from aluminum to copper. Who needs to worry about switching their wiring from aluminum to copper? CPSC research shows that homes wired with aluminum wire manufactured before 1972 are 55 times more likely to have one or more connections reach “Fire Hazard Conditions” than are homes wired with copper. “Post 1972: aluminum wire is also a concern. Introduction of the aluminum wire “alloys” in 1972 time frame did not solve most of the connection failure problems. Aluminum wiring is still permitted and used for certain applications, including residential service entrance wiring and single-purpose higher amperage circuits such as 240V air conditioning or electric range circuits. The fire risk from single purpose circuits is much less than for branch circuits. It’s not necessarily because of a “new alloy” as some folks assert. It’s because there are enormously fewer connections (four or six rather than 30 or 40 per circuit) and thus statistically a smaller chance of a connection failure. These connections do still burn up, as indicated by field reports. ALUMINUM WIRING [the history and the fire hazard] on April 28, 1974, two persons died in a home fire in Hampton Bays, New York. Fire officials determined that the fire was caused by a faulty aluminum wire connection at an outlet. Since that tragic accident, the U.S. Consumer Product Safety Commission staff and other government officials have investigated numerous complaints from homeowners throughout the nation who have had trouble with small gauge aluminum branch circuit wiring. The Commission has also had research conducted that shows that homes wired with aluminum wire manufactured before 1972 (“old technology” aluminum wire) are 55 times more likely to have one or more connections reach “Fire Hazard Conditions” than is a home wired with copper. The hazard investigated by the Commission staff occurs at connections to old technology aluminum wire, such as at outlets or switches or at major appliances such as dishwashers, furnaces, etc. 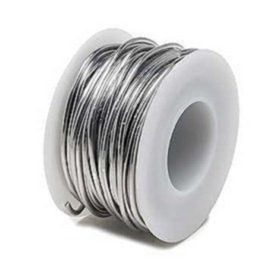 Corrosion of the metals in the connection, particularly the aluminum wire itself, causes increased resistance to the flow of electric current and that resistance causes overheating. Homes built before 1965 are unlikely to have aluminum branch circuit wiring. Homes built, rooms added and circuits rewired or added between 1965 and 1973 may contain aluminum wiring. In 1972, manufacturers modified both aluminum wire and switches and outlets to improve the performance of aluminum wired connections. Sale of the old style wire, switches and outlets still on dealers’ shelves however, continued after 1972. Trouble signs [of overheating aluminum wiring] Signs of trouble in aluminum wire systems include warm-to-the-touch face plates on outlets or switches. Unfortunately, not all failing aluminum wired connections provide such easily detected warning signs aluminum wired connections have been reported to fail without any prior indications or problems. If you do have aluminum branch circuit wiring, the Commission suggests that you have a qualified electrician check the system for impending trouble. Remember, you may not have noticed any of the warning signs, but research shows that trouble may develop over time and an electrician may spot potential problems before you notice them. CAN THE [aluminum wiring] PROBLEM BE FIXED? One method of eliminating the risks associated with old technology aluminum wiring terminations is to eliminate the primary cause; the aluminum wire itself. Depending upon the architectural style of your home and the number and locations of unfinished spaces (e.g., basements and attics), it may be relatively easy to rewire your home. A new copper wire branch circuit system would be installed, and the existing aluminum wire would be abandoned inside the walls. This is the most expensive method of repairing an aluminum wired home; but if you can afford the cost, it is also the best method available. Since it may be impractical to rewire some types of aluminum wired homes (i.e., condominium units), or since rewiring may be prohibitively expensive for some homes (i.e., split-levels with no unfinished areas), the Commission staff attempted to find a repair method which would permit the continued use of existing old technology aluminum wire.